Morning dress jacket made from a black pure wool satin. 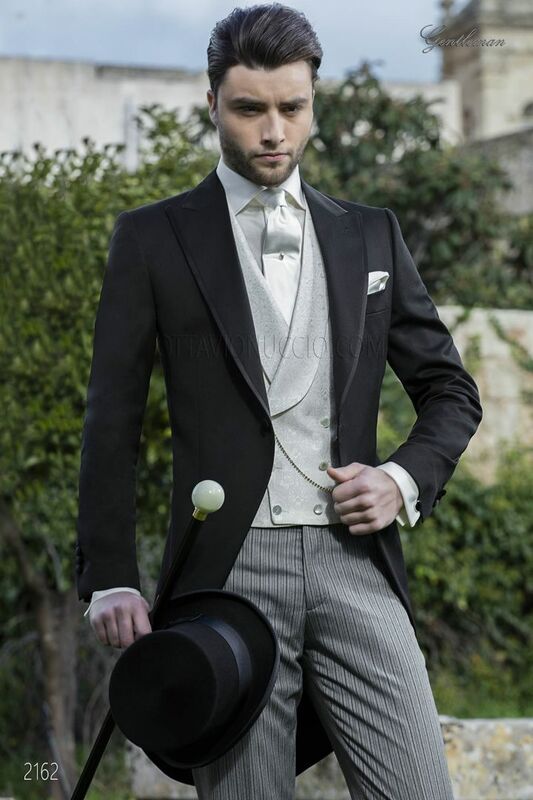 Peak classic lapel with contrast piping, no pockets on the front... Morning dress jacket made from a black pure wool satin. Peak classic lapel with contrast piping, no pockets on the front, one corozo button with straight buttonhole and 3 corozo buttons with straight buttonholes for each sleeve. Single vent, redingote-style seams and classic pleats with twin corozo buttons at rear. Rounded finish to stylize the figure and tail of jacket suitable for any height. Morning dress Pants made from a black and grey striped fabric with back pockets. White in brocade double-breasted waistcoat and 6 mother-of-pearl buttons closure and 2 double welt pockets Back lining w... White in brocade double-breasted waistcoat and 6 mother-of-pearl buttons closure and 2 double welt pockets Back lining with elastic band to adjust width. 8.5cm tie and handkerchief set made from avory satin. Handmade.